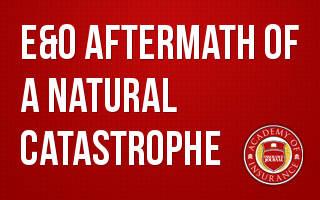 When a large natural catastrophe occurs, agencies always put forth great effort to care for their employees and clients. The re-organization of priorities required to service all the claims is significant. Most differences are settled, but inevitably, some insureds file E&O claims. When the claims arrive, agency personnel often feel like they're the victim of a second bombing run, the natural catastrophe the first. They are sometimes paralyzed and fail to improve their agencies, which is critical because a third bombing run, albeit a smaller one, is coming and the best defense is to prepare immediately.